The state employment and unemployment figures for October, released today by the Bureau of Labor Statistics, were slightly more encouraging than the previous few months. Job growth remained steady in most states and unemployment rates ticked down slightly more, on average, than was the case heading into fall. Still, the U.S. labor market is far from fully healed. In fact, this month’s report marks something of a bittersweet milestone: there are now 25 states that have reached their pre-recession unemployment rates. Only 25 more to go. From July to October, 37 states and the District of Columbia added jobs, with Idaho (+1.5 percent), Nebraska (+1.2 percent), and Arizona (+1.1 percent) posting the largest percentage gains. The gains in Idaho and Arizona exemplify the strong growth experienced in a number of western states of the past year. Since October of 2014, states in the West—particularly those off the coast, such as Utah, Idaho, and Nevada—have had the strongest job growth nationwide. 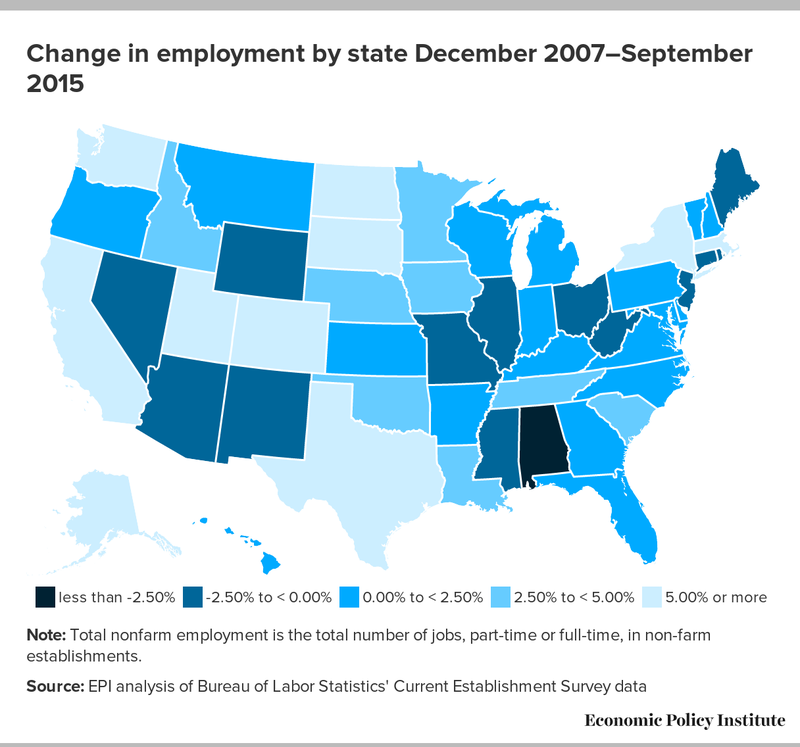 Job totals fell in 13 states from July to October, although only North Dakota’s (-0.7 percent) and Louisiana’s losses (-0.3 percent) seem indicative of a trend. 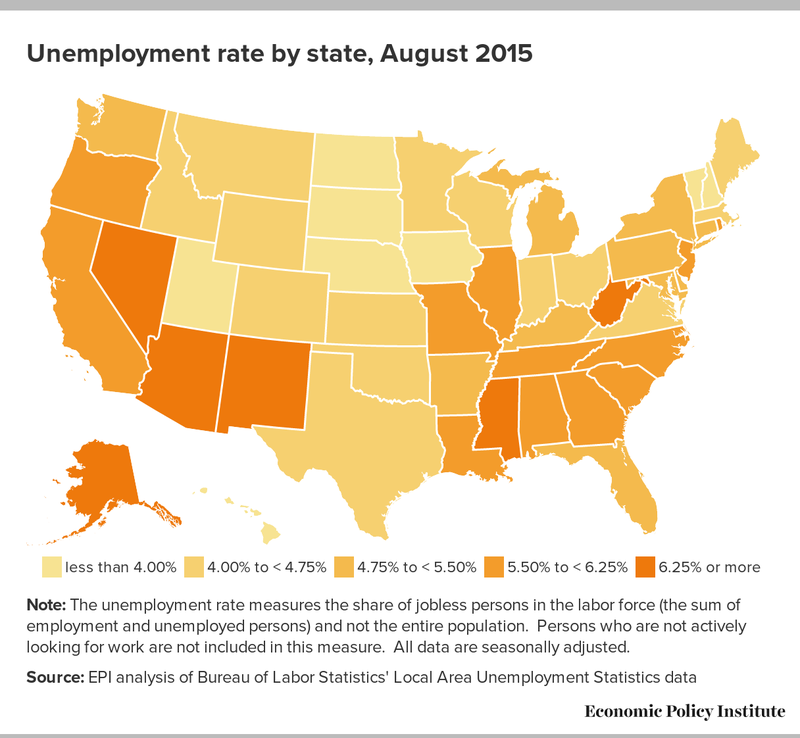 Unemployment rates fell in 40 states plus the District of Columbia since July. The largest reductions were in Missouri (-0.8 percentage points), South Carolina (-0.8 percentage points), Mississippi (-0.6 percentage points), New York (-0.6 percentage points), Ohio (-0.6 percentage points), South Dakota (-0.6 percentage points), Virginia (-0.6 percentage points), and West Virginia (-0.6 percentage points).